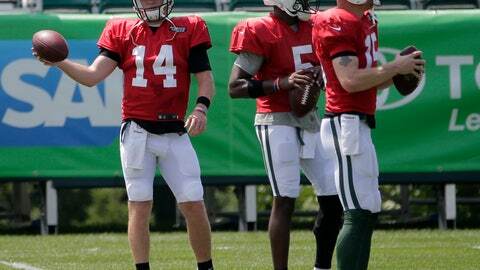 FLORHAM PARK, N.J. (AP) — The New York Jets‘ three-man quarterback competition could last the entire summer. Coach Todd Bowles is in no hurry to make his decision on whether it will be Josh McCown, Teddy Bridgewater or Sam Darnold under center as the starter in the team’s regular-season opener at Detroit on Sept. 10. “You’ve got to play preseason games,” Bowles said Monday. “I’m not into hypotheticals and nothing that hasn’t happened yet. We’re going to let them play. And after the fourth preseason (game), sometime that week, I’ll make my decision and go from there. Usually, teams have their starters determined by the third preseason game, when the first-teamers play the bulk of the snaps. The Jets’ coach could also keep the team’s starter under wraps until the night of the game against the Lions. “The guy who runs out on the field (Monday night) in Week 1, we’ll see who the starter is,” he said. McCown is the incumbent and still is No. 1 on the depth chart with the first unofficial list released Monday. But, Bridgewater — who’s No. 2 — and Darnold — listed at No. 3 — saw extensive action in practice. McCown got just 10 snaps in team drills, while Bridgewater had 32 and Darnold a whopping 55, including 16 with the starting offensive line. Bowles said he has an idea of how the Jets will use their quarterbacks in the preseason opener against Atlanta on Friday, but wants to discuss it with his staff before revealing the plan. In fact, there’s no guarantee that McCown will even play against the Falcons. Last summer, McCown played the first series of the preseason opener and didn’t see the field again until three games later as the Jets gave Bryce Petty and Christian Hackenberg extended looks. This year, Bridgewater is shaking off the rust from being sidelined nearly two years because of a severe knee injury, while Darnold is the No. 3 overall pick who is considered the future of the franchise. Darnold has been in camp for just a week after missing the first three practices of camp while working out details in his contract. He quickly got up to speed and had a few solid performances last week, including in the team’s scrimmage. But the rookie was up and down Monday in 92-degree heat with high humidity, making a few terrific plays and also coming up short on others while not looking as sharp as he had. He also showed some frustration, pumping his fist angrily after one play. So are his teammates, who have seen quite a bit of growth in just the last week. Darnold’s ability to make quick reads on the defense and make plays on the fly is impressive. During one play, Darnold looked at his first read and saw he was covered. So, he checked the second receiver — and he, too, was covered. So, the rookie then went to his third option and connected with a wide-open running back Trenton Cannon for a touchdown. “It’s awesome to be able to find my groove in the offense,” Darnold said. Darnold’s biggest test will come against the Falcons on Friday night, when he could end up playing the entire second half. “I have high expectations that he’ll go out and play well,” McCown said of his young teammate. NOTES: Cannon had his right foot or ankle checked out by a trainer late in the practice and didn’t return. The sixth-round pick is having a strong camp. … Among those who didn’t practice because of injuries: WR Quincy Enunwa, LT Kelvin Beachum, NT Steve McLendon, CB Parry Nickerson, LB David Bass, DT Deon Simon, RB Thomas Rawls, DB Kacy Rodgers. … The Jets signed OL Alex Balducci, who was in camp with New York last summer, and waived OL Austin Golson. … Rookie Nathan Shepherd, a third-rounder, is listed as a starter at DE on the team’s first unofficial preseason depth chart.